Imagine relaxing in your backyard and hearing the soothing sounds of running water or watching as the water cascades down over a mountain of natural stone. In addition to the value a water feature will add to your home, it can enhance your lifestyle as you enjoy a renewed sense of calm while you spend time outdoors with family and friends. With custom water feature design and installation services from Lawrence Landscape, you can be sure your new water feature will blend seamlessly with your existing outdoor environment. Our experienced team of professionals will install your water feature using only the finest quality materials and superior craftsmanship to ensure that it will provide you with years of effortless enjoyment. Get started on your new water feature today by calling Lawrence Landscape at 785-843-4370, or contact us online to request a quote. Attract birds, butterflies, and animals with the installation of a bird bath used for drinking, bathing, and preening. Choose from a pedestal design with an integrated fountain or bubbler for best results, as the added motion of the water will attract a greater volume and variety of species. A fountain is a more traditional, formal design element that commands attention. Whether you prefer a multi-tiered cascading motion or a more stately, statuesque water fountain, we can customize your installation to suit your exact needs and specifications. A backyard pond will provide you with endless hours of peace and tranquility, and can be enhanced by the addition of fish, plants, or a waterfall feature. A cascading waterfall is the ultimate in luxury and is a versatile water feature with endless options for placement and design. 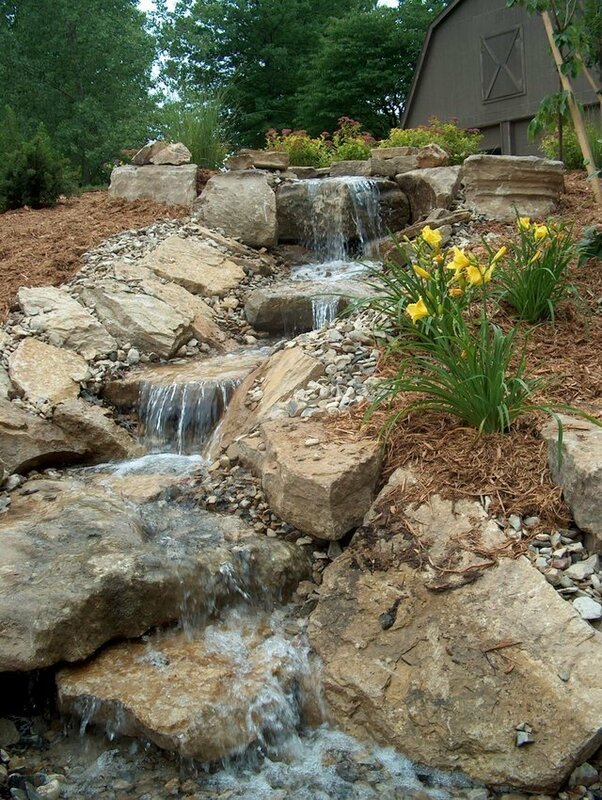 A grand, multi-layered waterfall can be the focal point of your landscape design, or you may choose a subtler feature set against the backdrop of a garden wall or fence. Flowing water helps to absorb the surrounding noise pollution, while providing calming ambient noise. Negative ions are released by moving water, helping to attract dust and other small particles and purifying the air. As water evaporates and turns to vapor, it also helps to filter the air, reducing pollution even further. A water feature can help reduce the ambient temperature in the immediate vicinity by up to 20 degrees, making it a great place to hang out on a hot summer day. There are no hard and fast rules when it comes to the dimensions of your water feature, and most can be customized to suit even the smallest yard. Birds, insects, and animals are attracted to water and will be drawn to your water feature. Bring the beauty of nature to your outdoor space and have fun watching the wildlife enjoy your new addition as much as you do. Our talented designers and skilled landscape crew will help you create the outdoor space you’ve always dreamed of, complete with a customized water feature that fits your home and lifestyle. Call us today at 785-843-4370 to request a quote for your Lawrence water feature design, or contact us online and let us know how we can help.